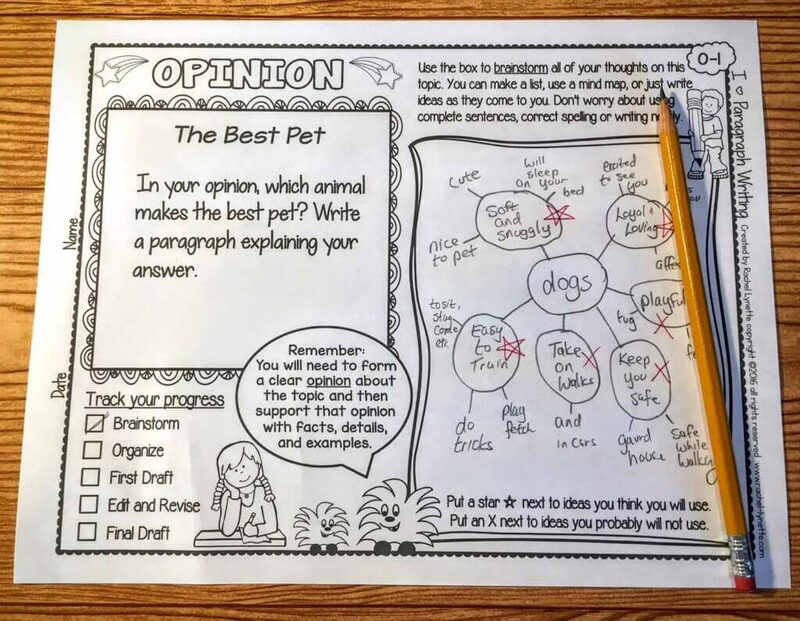 Writing a good paragraph includes so many skills – organizing and sequencing, word choice, varying sentences, understanding topic sentences, good grammar and so very much more. 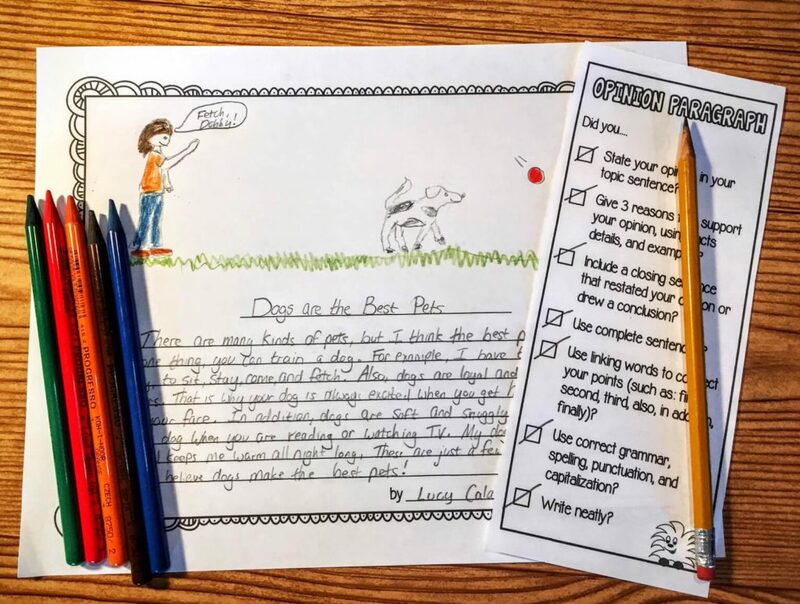 While all of these skills need to be taught and practiced repeatedly, you also want to keep your students engaged with motivating writing prompts and a process that won’t bore them to tears or frustrate your struggling students. Keep reading for a time-tested method for getting your students to write good paragraphs. Be focused on something interesting, relevant, and fun. Consider favorites – book, movie, food, etc., fun events, “would you rather” questions, “what if” questions, holiday themes, sports, hobbies, celebrities (for older students), etc. The student should already be the expert. Don’t choose a topic that requires research. The skill they are trying to master is paragraph writing, not research. If you are working on a specific type of writing (opinion, narrative, informative, etc. ), then make sure the prompt easily lends itself to that type of writing. Brainstorming should be easy and fun. The purpose is just to get everything the student knows about the topic on paper. Don’t make your students worry about neatness, spelling, punctuation, etc. As long as they can read it, they’re good. Students can brainstorm with lists, mind maps, or just a streaming paragraph. When they are done, have them pick out 3-4 of the ideas for use in their paragraphs. Marking them with a star or smiley face works well. 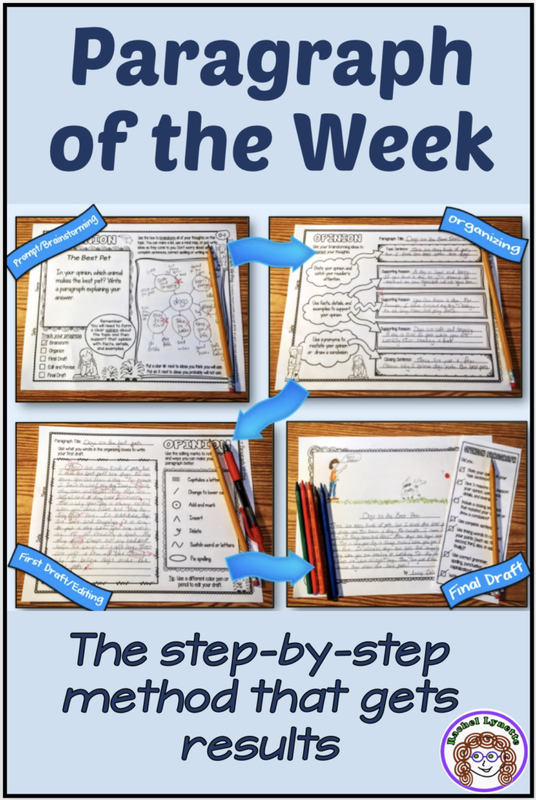 In this phase students take their 3-4 best brainstorming ideas and put them into sentences. 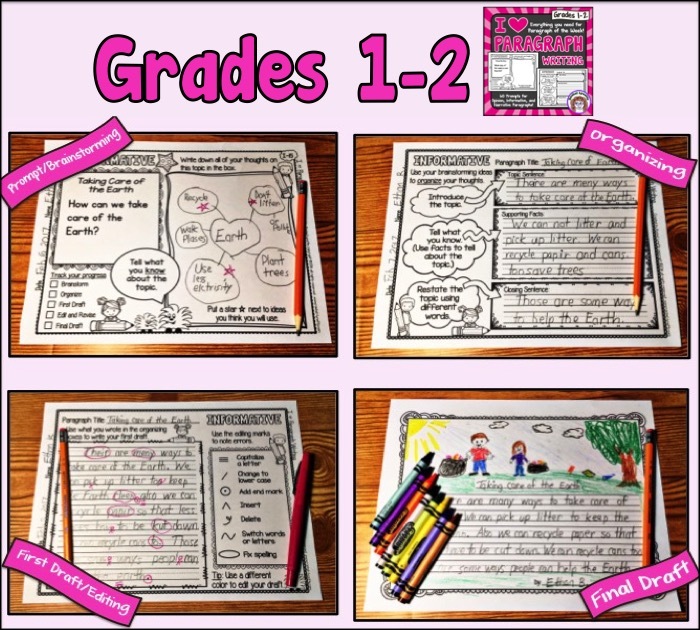 A single idea may take just one sentence, especially for the youngest writers, but for most students, it will require two or three. In these sentences, students are adding details, examples, and definitions to their paragraphs. They will also want to focus on the sequence to be sure their points are organized in a logical way. Once they have written their supporting details, have them read through them all and write a topic sentence. The topic sentence should give the main idea of the paragraph and catch the reader’s attention. It is often easier to write the topic sentence after writing the supporting details. To that point, when I was writing nonfiction children’s books, I always wrote the first chapter that was meant to introduce the topic last, as it gave me a clear idea of what was actually in the book. 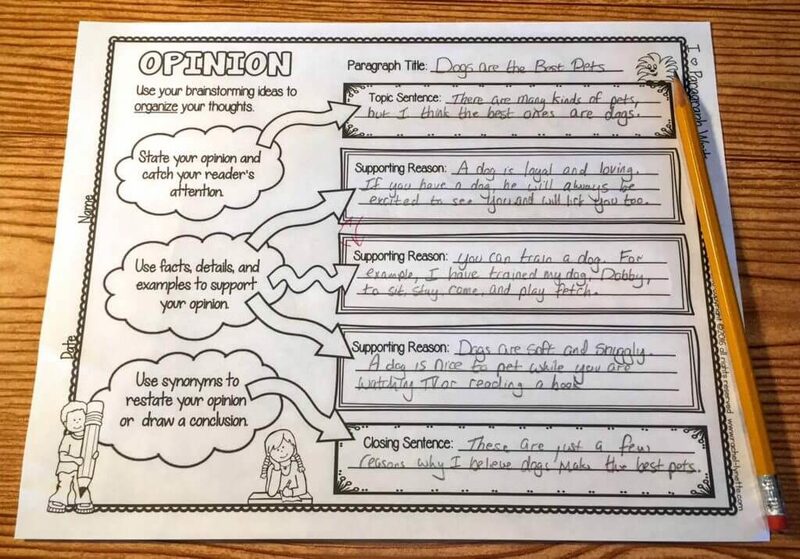 Finally, have your students either restate their topic sentence or draw a conclusion to write their concluding sentence. As your students become more proficient writers, you can skip this step and go directly from brainstorming to first draft. However, for beginning writers, this is a critical step. Here is where your students put it all together in paragraph form. As they write their draft, they will need to add transitions words to make their points progress smoothly. 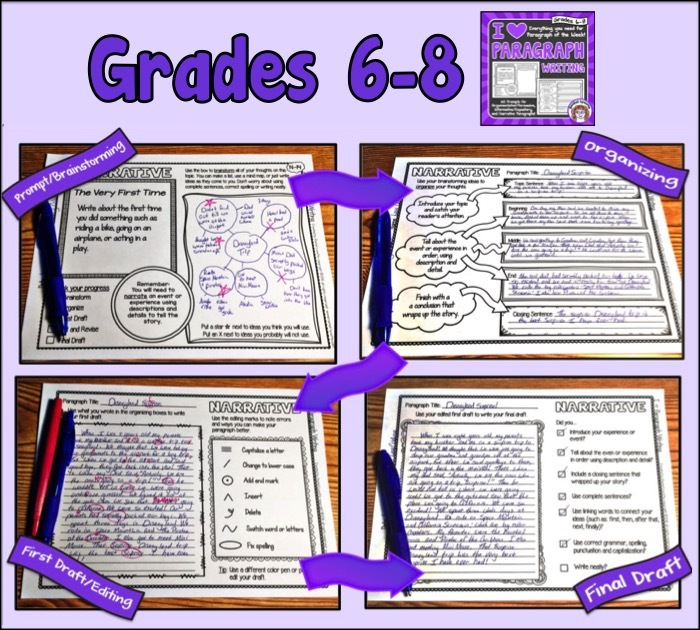 You may want to have students skip lines or use bigger lines so that there is room for the next step: editing. 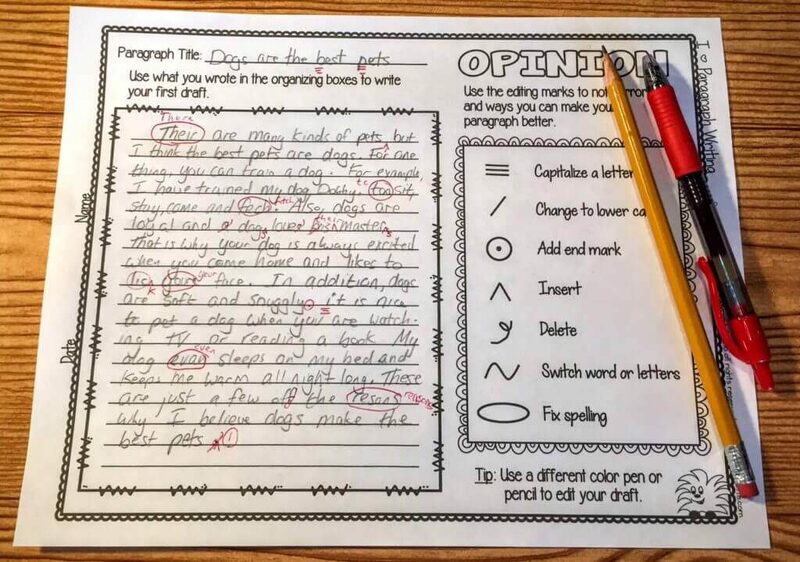 In this step students go over their first drafts using editing marks to mark things they want to change – ideally with a different color pencil or pen. The goal of editing and revising is twofold: first, to find and correct any mechanical errors and second, to make the paragraph better. This could mean rearranging the sequence, adding descriptive adjectives and adverbs, deleting irrelevant or repetitive parts, etc. Make sure your students have an editing key handy. Also, using small Post-It notes can help if students are running out of space. The final draft is the last step. Final drafts should be neatly written or typed and error free. While final drafts can be done in notebooks, you may want to give students special paper or perhaps paper that has room for an illustration. Our school is going digital. Could you create a Google friendly digital version? This is a great product. If you want both the digital and the original print versions, just click on the blue cover above. I’m with Heidi. A Google friendly version would be great! Will this be something that’s easily understood by 9th Grade Autistic students who function about a fifth grade level? I think it would, but not knowing your student, I could not say for sure. Trying to order the 3-5 grade version but when I add it to the cart it says 1-2 grade. Thanks so much for bringing this to our attention! 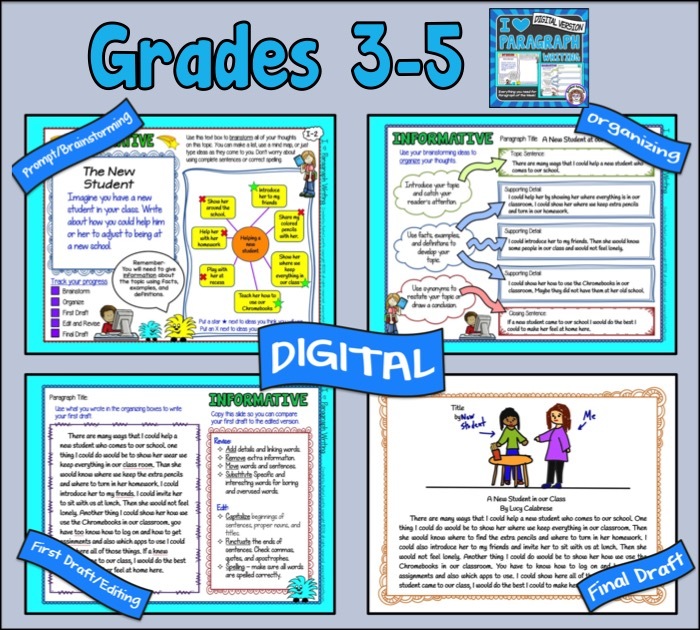 I’ve fixed the link, so it now correctly links to the 3rd-5th grade resource. What’s the difference between the levels? 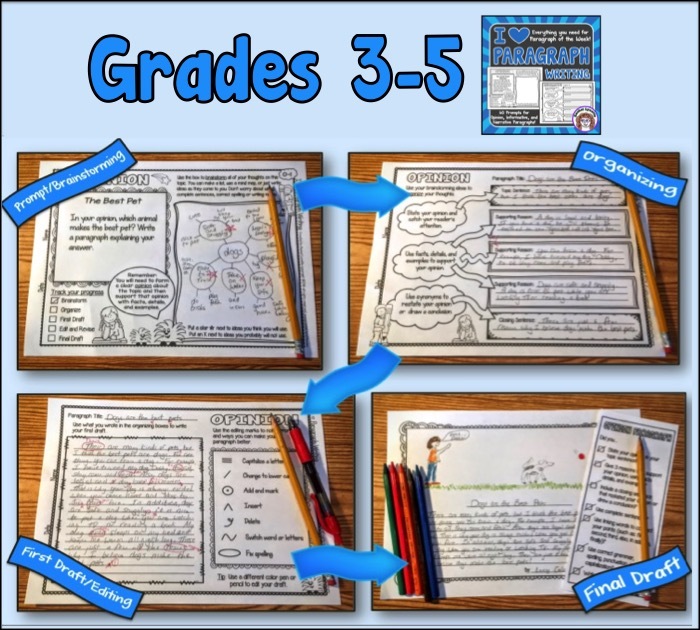 First off, each of the three versions is written with the grade-level Common Core standards in mind, so the requirements and terminology change. Also, the middle school product comes in two versions – one with CC terminology and one with traditional terms for the different types of writing. Second, The student writing lines change with the grade levels. For the primary version, primary lines are used in two different sizes. This allows for younger students to write bigger and older ones to write more. Also, fonts decrease in size in versions for older students. Third, clip art is appropriate for grade level. Other than decorative frames, there is no clip art in the middle school version. Also, at this time, the 3-6 (blue cover), is the only version that also includes a digital, Google Drive option. Do you know when 6-8 will be available digital? I am wondering if I can edit the writing prompts in the the digital/printable version? I teach specific units of inquiry and I would like to be able to adapt this resource to support topics relevant to my students. While you can’t edit the actual text, there is a blank prompt sheet for each of the three types of writing, so you can fill in your own prompt. Hopefully, that will do the trick. Maybe it’s a lot to ask, but have you offered a free sample lesson for 1st grade? I am really wanting to try this with my first-ies but you know how challenging they can be when you are trying to get them to be MORE independent? !